The photo was taken Monday at Cape Canaveral in Florida — the Endeavour and the Shuttle Aircraft Carrier are due to leave for the first leg of the trip to Los Angeles at 7:15 a.m. on Wednesday. The Endeavour will spend Wednesday night in Houston and then arrive on Thursday at the Dryden Flight Research Center at Edwards Air Force Base. On Friday, the Endeavour will depart early in the morning for Northern California and then arrive back in Southern California about 10:30 a.m. with planned low altitude flights over several local landmarks, including the Malibu area, Getty Center, the Griffith Observatory, Disneyland, the California Science Center in Exposition Park and Los Angeles International Airport, reports the L.A. Times. 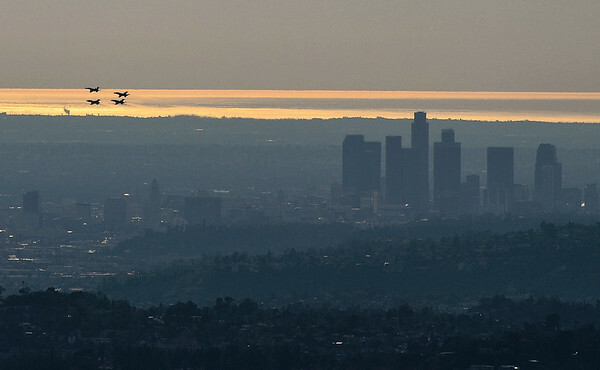 The shuttle is due to arrive at LAX about 11 a.m. Friday. The easiest access point on the Metro system would be to take the Expo Line to the USC/Expo Park station and stake out a spot in the park. The Los Angeles City Hall observation tower is also near the Red/Purple Line Civic Center station and the Gold Line’s Little Tokyo station — but I’m not sure how good views will be from there. The Griffith Observator seems to be a good vantage point but unfortunately there is no bus shuttle service there on weekdays. Anyone else out there have some good ideas? Brainstorm please. Sounds like NASA is going to release some more info on Wednesday. Take the FlyAway to LAX, get a table at the ‘Theme Building’. The Geatty is accesible via transit. Take the Mt. Lowe railroad up to Mt. Wilson (scratch that, good location for those with a long lens, but transit poor. Take the Green Line to Mariposa, then walk to the closed-to-traffic section of Imperial Ave.
Take the Green Line to Aviation/LAX station, then walk up Aviation Blvd. to the Proud Bird Restaurant, you’ll be right there! Where’s the best view of the trees being cut down to make room for the shuttle? There will be a shuttle service from the Greek Theatre parking lot to the Griffith Observatory Friday morning between 8am to noon.